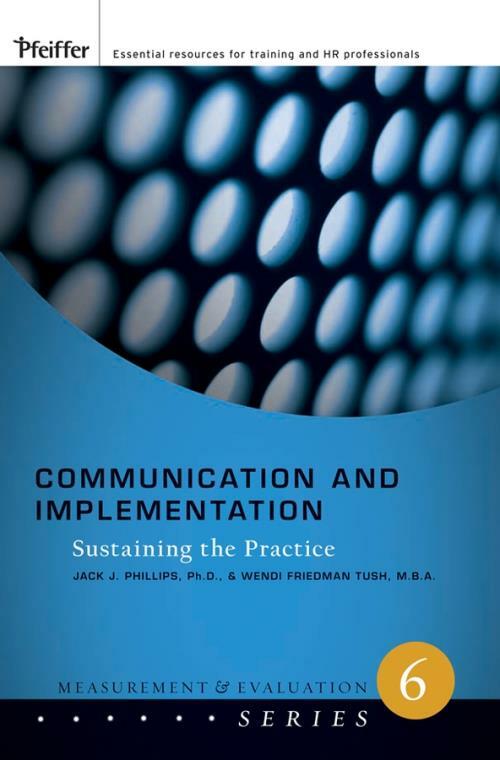 Communication and Implementation is the sixth of six books in the Measurement and Evaluation Series from Pfeiffer. The proven ROI Methodology developed by the ROI Institute provides a practical system for evaluation planning, data collection, data analysis, and reporting. All six books in the series offer the latest tools, most current research, and practical advice for measuring ROI in a variety of settings. Communication and Implementation explores two important topics that are vital to the ROI Methodology reporting results and sustaining the process. The authors show how to report results that will ensure that the audience has the information needed so that the improvement processes will be implemented successfully. The book explores the range of reporting methods, including face–to–face meetings, brief reports, one–page summaries, routine communication, mass–audience techniques, and electronic communications. The authors offer suggestions for determining the best methods to employ. In addition, Communication and Implementation contains information on how to keep the ROI process going for the long haul and how to make it a valued process for any organization. Communication Strategy Shaped by the Audience s Opinion of the Program Team. Analysis of the Need for Communication. Communication Plan for the Entire Program. Communication Plan for the Impact Study. Basis for Selecting the Audience. Development of the Information: The Impact Study. Organizational Publications and Standard Communication Tools. Presenting Impact Study Data to Senior Management. Communicating with Executives and Sponsors. Strengthen the Relationship with Executives. Distribute Memos on Program Results. Ask Executives to Participate in Program Review. Analysis of Reactions to Communication. Advantages of a Macro–Level Scorecard. 2. Making the Transition to the ROI Methodology. Overcoming Resistance to the ROI Methodology. Efficiency Is Always an Issue. Step 3: Communicate a Vision. Step 4: Manage the Transition. Step 5: Establish Management Infrastructure to Support the Process. Prepare Policy, Procedures, and Guidelines. Structure ROI as a Learning Tool, Not a Performance Evaluation Tool. 3. Building Capability and Support. Fundamental Issues in Implementing the ROI Methodology. Developing Evaluation Targets for the Staff. Using ROI as a Learning Tool. Selecting Programs for ROI Evaluation. Building an Effective Partnership Between Program Staff and Senior Management. Enlisting Support from Top Management. The Overall Importance of Programs. The Process of Program Development and Evaluation. Monitoring Progress and Communicating Results. 4. Sustaining the Use of the ROI Methodology: Keeping the Process on Track. Actions That Sustain the ROI Methodology. Calculating the ROI on Implementation of the ROI Methodology. Establishing Mechanisms for Continuous Improvement.